WECHANGE has the pleasure of being at UkraineLab 2017, a forum for Ukrainian civil society, which is taking place this time in Ivano-Frankivsk. Read about our impressions of the first day of the forum here. Walking past the Promprylad factory, you might not suspect that there was anything special about this industrial complex. 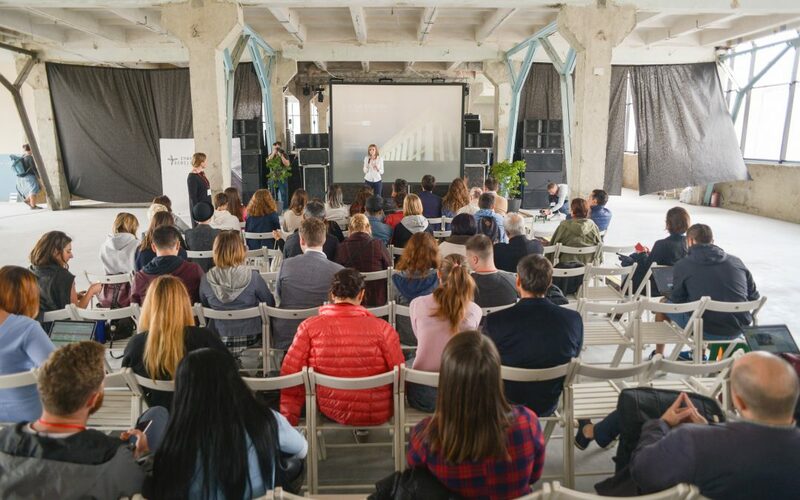 Yet, if you turn the corner and go up to the third floor, you would find one of the locations of this year’s UkraineLab in Ivano-Frankivsk, a factory floor turned large-scale cultural space. Promprylad itself is the subject of a renovation project, that aims to turn the whole factory into a vibrant complex with everything from co-working spaces to practice rooms for local musicians. It is well on the way to becoming an ‚impact place‘, somewhere that is more than just a building, but a space that influences its surrounding community. How one goes about this is exactly the topic for the UkraineLab forum. It was in this imposing post-industrial setting that the event kicked off with a guided tour round the Supernova art exhibition. The works are the brainchild of a duo of Ukrainian artists, the Krolikowskis, and they synthesise everything from cosmic processes to Jane Fonda (seriously). This was followed by the official opening of the forum with speeches from the organisers, from Ukrainian NGO Insha Osvita, and representatives from Vilna Khata, an open space for creativity in Kramatorsk, and Impact Hub Odesa – two examples of impact places in Ukraine. Spurred on by inspirational stories of best practice, it was time to get to know some of the organisations represented at the forum. At this LinkLab, Wechange was privileged to present our platform as an example of an online „impact place“, alongside Ukrainian initiatives, such as Khata Maysternya, a project that has renovated an old hut in the Carpathians and turned it into a hub for learning and bringing people closer to nature. Dinner was then hosted at Urban Space 100 and accompanied by an inspirational talk by its founder Yuriy Fylyuk. The restaurant collected social capital from 100 donors and first opened its doors in 2015. Since then, 80% of all profits from the restaurant are spent on city development projects in Ivano-Frankivsk, with over 50 being funded so far. Furthermore, there is an in-house radio station, dedicated to promoting the latest alternative Ukrainian music. An excellent example of social entrepreneurship committed to the common good. It’s currently in the process of planting a franchise in Kyiv, with future projects planned in Kramatorsk and…Berlin! We can’t wait to get involved with an Urban Space restaurant in our neck of the woods. To round off such a full first day of UkraineLab, it was the turn of our ear drums to become an ‚impact place‘ for the pulsating rock of local bands. Promprylad has for many years provided a rehearsal space and venue for various bands, earning the nickname „Rock Factory“. We would try and describe the unique atmosphere of the gig, but as Yuriy, the lead singer of one of the bands, Bingo, told Wechange, „You just have to be there.“ So the next time you’re in Ivano-Frankivsk – you better check it out…!